Hike the trail as shown on the map in the Trail guide from Sutter’s Fort to Old Sacramento and return (about 5 miles). Visit the State Capitol and the State Railroad Museum. A Visit to Sutter’s Fort is recommended. Admission is charged. 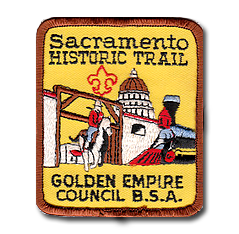 File a report with the Golden Empire Council listing the names of Scouts and Scouters that complete the hike. A Patch may be purchased at the Scout Shop. Contact the Scout Shop at (916) 929-1417 or 1-800-427-1417 to determine price and place an order.